Bursting with seasonal veggie flavours, this Zucchini and Broccoli Soup is a tasty winter warmer. Quick to make, it freezes well and can be reheated quickly for when you’re stuck for time. This is it, move week is here! Most of our memories, belongings and knick-knacks have been carefully packed away, awaiting – admittedly more patiently than any of us, their shift to our new home on Friday. With a half-packed away kitchen and an emptyish fridge I have been busy planning out this week’s meals that would give us the energy needed to move but be easy to make and quicker to serve. Luck had it that in amidst of all this commotion, I was contacted by some lovely people working for Jamie Oliver inviting me to take part in a seasonal Soup Challenge as part of the Food Revolution Day which falls on this Friday, May 17th… our move day! The whole idea behind Food Revolution Day is simple: cook it, share it. As part of the challenge we are provided with a fresh veggie box of seasonal produce from Aussie Farmers Direct. It’s a fantastic service that delivers fresh produce directly to your door – you can check out this week’s box contents here. You can share your seasonal recipes or snaps via Facebook, Twitter or Instagram using the hashtag #FRD2013 or tagging the @FoodRev team to let them know you’re in! I will be! 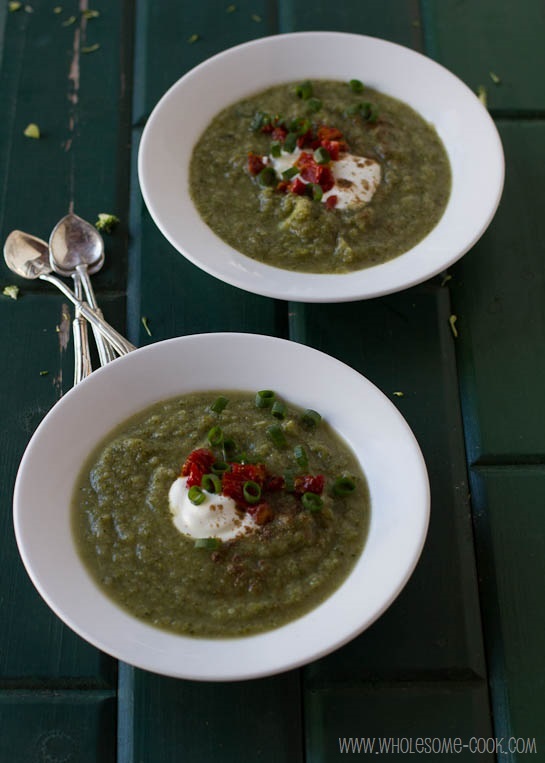 A tasty green vege soup that can be made ahead of time and frozen for convenience. Serve with a dollop of Greek yoghurt, sundried tomatoes or croutons, if you prefer. Heat oil in a medium saucepan over low heat. Add onion, garlic and chilli and cook for a minute, stirring, until fragrant. Add zuccchini, celery and herbs. Cook for another minute or until zucchini is slightly softened. Add stock and broccoli florets. Bring to a boil. Remove from heat and blend using a stick blender or transfer into a jug blender. Season with salt and pepper to taste. Serve immedieately, topped with a spoonful of Greek yoghurt, some diced sundried tomatoes and sliced spring onions. G’day LOVE how vibrant your photos are, TRUE! WHO knew broccoli and zucchini combination could look so inviting too! Thank you! What a wonderful soup, Martyna! How did you know these were exactly the vegetables which have to be used next from my fridge? Tomorrow without doubt! Altogether thank you for the list of seasonal soups: I used to be somewhat of a slouch making them, but decreasing temperatures and somewhat increasing waistline has made me think . . .
What a beautiful soup! I’m still waiting for my box’s arrival. I have no idea what will be in it until it gets here so I can’t plan ahead. 🙂 I hope your move goes smoothly and everything quickly finds a spot in your new home. Moving house can be very stressful but exciting at the same time. 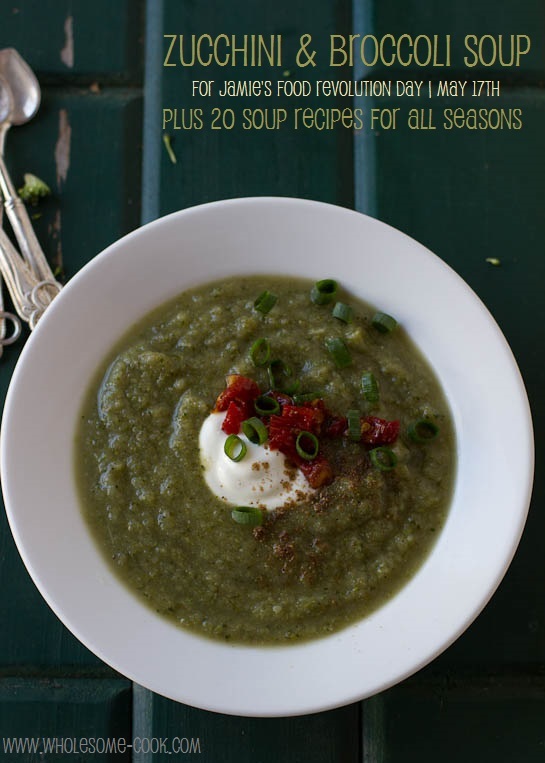 Thanks for featuring the Scandinavian Rhubarb Soup recipe! I hope you and your readers enjoy it! Good luck with your move! And yummo re soup. We’re having left-over-roast-veg soup for dinner tonight – the leftover roast pumpkin, onion, eggplant and zucchini all being chucked in the thermomix with some stock, heated and blitzed. So easy! 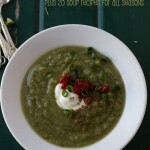 I love a green soup Martyna! Makes me feel so healthy. This one sounds like an absolute winner. 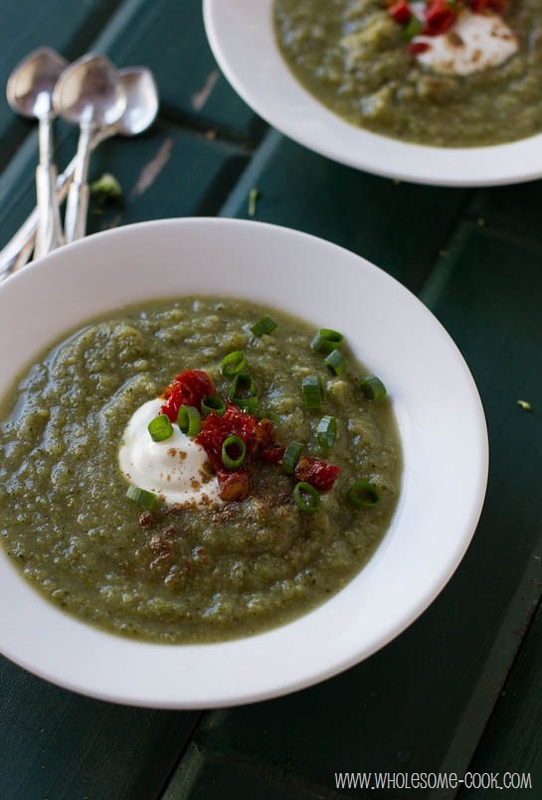 Love your zucchini and broccoli soup, Martyna, and thank you for including my Vegetable Spring stew in your list!